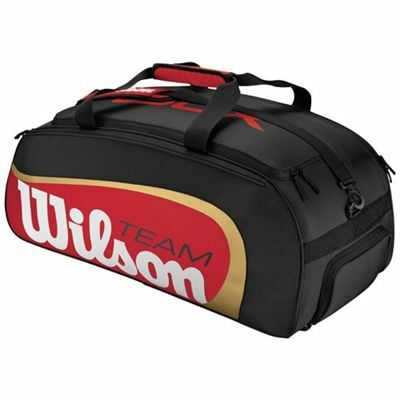 The Wilson Team II BLX Duffle Bag is a stylish, durable and practical bag. It’s perfect for travelling or storing your gear in an organised manner and is part of a range of tennis bags that are the first that expand to fit your needs as they change. This excellent bag is made from durable and hardwearing fabrics, has four extra large outer pockets and a large racket compartment that holds up to 4 rackets. With a massive 80 litre volume it'll hold just about everything and anything you want. for submitting product review about Wilson Team II BLX Duffle Bag.